Albany, New York — On Saturday night, 50 Cent took a page out of Kanye West's book and told the crowd at his concert he would be debuting a brand-new song from his upcoming album — not via mixtape, not via radio, not via blog, but via live concert performance. "What I want everybody to do right now is take your cell phones out, get your cameras out," Fif urged the audience at the Times Union Center. "Tonight, Albany, New York, I'm gonna give y'all an exclusive. I'mma perform my first single off my new album, Before I Self Destruct." Then, the bass-heavy beat from Kanye West's new song, "Love Lockdown," came thundering through the speakers. Was this a miscue by DJ Whoo Kid? bewildered fans in the crowd wondered. Nope! G-Unit knew exactly what they were doing: 50 began singing the song — "I'm not loving you ..." — clearly mocking Mr. West. 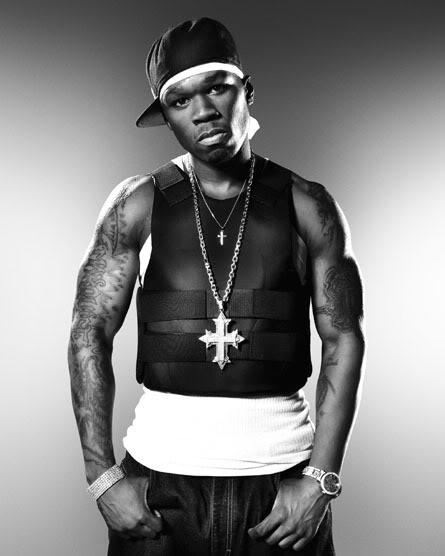 "That's what y'all are left with," Fif said, after covering the first verse. He was making reference to the much-ballyhooed SoundScan battle between himself and Kanye just over a year ago, when both MCs released albums on September 11. 50 was soundly thumped in the battle: More than 300,000 more fans favored 'Ye's Graduation over the Queens native's Curtis. "I'll forgive y'all for that one," 50 said. It seems a Kanye/ 50 second round could very well be on the horizon. 50 said Before I Self Destruct is coming out on December 9, and West's 808's & Heartbreak is reportedly slated for a December 16 release date. But we all know how easily in-store dates can change, and even if the releases remain a week apart, it's going to be intriguing. On Saturday night, 50 fed a rabid audience with more than 20 songs from his catalog, rocking the stage for close to two hours. G-Unit — featuring Lloyd Banks and Tony Yayo — started their set with "Rider Pt. 2" wearing military jackets, and the focus on the group's latest LP, T.O.S. : Terminate on Sight, continued with records such as "Straight Outta Southside." Although the album was considered a commercial flop, the crowd was very familiar with the material and rapped along. Later, 50 took it back with "Candy Shop" and the hard-hitting "I Get Money"; the greenback anthem shook the arena to its foundation. More hits followed with "P.I.M.P." (50 brought out a white fedora for that one) and "Gunz Come Out." The Unit's attention then steered toward the underground with mixtape cuts like the boldly titled "I F---ed Your Girl." "Now, I been here before, but this is Tony's first time," 50 began explained to the crowd. "I want y'all to help him out." Yayo said, "I want my man to rock with me" — and then pulled Flavor Flav, of all people, from the crowd. Whoo Kid dropped "So Seductive" and Flav and Yayo began doing Flav's signature dance — it was a classic moment. Surprisingly, that was Flav's second show-stealing moment of the night. LL Cool J — who surprised the crowd with an unannounced, multi-song set earlier in the night, as he did in New York in July — said at one point that he needed two guys and five girls onstage with him. While most of them appeared to be random fans, one of the guys ended up being Flav. "You — money, right there," L said to his friend of more than two decades before the reveal. "Come onstage!" Flav and company all danced to Cool J's "Around the Way Girl." LL's set combined his timeless hits with cuts from his new LP, Exit 13. During his latest single, "Baby," he handed out roses to the women in the crowd. However, one person in the venue was not feeling so festive. Keyshia Cole stunned the crowd by walking offstage after performing just a few songs, barking at the soundman just before she left. Ne-Yo performed a set just after Cole left the stage. The singer/songwriter tore things down with tracks from his own albums, including the just-released Year of the Gentleman — but when he started to play some of the monsters he's written for others, like Beyoncé's "Irreplaceable," Jennifer Hudson's "Spotlight" and Rihanna's "Take a Bow," the crowd went insane. Two of the advertised performers for the night were no-shows: Young Jeezy (whose named had dropped off the bill days before the show) and Plies. The latter MC is slated to perform with 50 and the Unit at Baltimore's 1st Mariner Arena on Friday. Kanye West and 50 Cent are set to repeat their album showdown of 2007, but this time will release their new records one week apart. The pair went head-to-head last year with the release of West’s ‘Graduation’ and 50’s ‘Curtis’, with Kanye ultimately securing the top spot in the first week of release. Now both artists will release albums in December, with 50’s dropping on December 9 and West’s on December 16. Last year’s chart battle was highly publicised, with 50 vowing to quit music if he did not sell more records in the first week of release than Kanye West.